You can call us during business hours on (+44) 01803 832272. 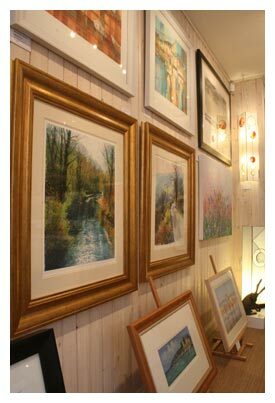 Tick to subscribe to our mailing list and be entered into our regular FREE PRIZE DRAWAs a thank you to all our loyal subscribers, we are giving you 3 chances every year to win a voucher for £100, to spend in the gallery or on our website. The draws will take place every 4 months on the 1st March, July and November and the lucky subscriber each time will be announced in that month's newsletter. So just carry on subscribing to be updated with our latest news and for a chance to win! Travelling south take the M5 to Exeter and then the A38 towards Plymouth, leaving at the Totnes turning on to the A384. On reaching Totnes turn right at the first set of traffic lights onto the A381 following signs to Dartmouth. After 6 miles turn left onto the A3122 to Dartmouth, at Halwell. Dartmouth is a further 7 miles from here. You can reach Dartmouth on a number of ferries from Totnes, Brixham and Torquay or take the Paignton to Dartmouth Steam Railway for a great day out. 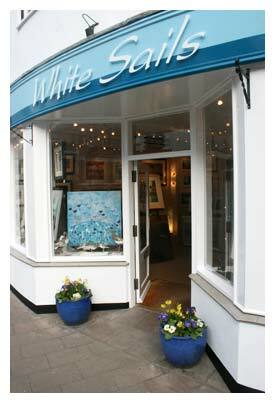 White Sails is situated on the junction of Newcomen Road and Lower Street at the southern end of the town, only 2 minutes walk from the Boat Float and Town Quay, along Fairfax Place.